Waterford bedding with European styling and design. Classic. Classic "Essex" bed linens in serene neutrals create a timeless look. White cotton sheet set includes 200-thread-count flat and fitted sheets and pillowcase(s). Floral-print linen duvet and shams. Solid dust skirt. Decorative pillows and shams Soft white Hampton bed linens by Legacy Home are irresistible in both look and price. Elegant and refined, the bedding ensembles by Waterford Bedding lend a timeless beauty to your bedroom décor. Available in a range of designs - from subtle, modest color schemes to bold, vivid patterns - you'll find a look that's right for you with Waterford Bedding collections. Bring the grandeur of Waterford Fine Linens to your bedroom with the Raquel duvet set featuring an oversized damask pattern in clip jacquard technique. 100% cotton ivory ground with gray motif. Add elegance and style to your bedroom with the Victoria bedding collection. Victoria is a beautiful large scale, woven damask pattern in lovely shades of orchid grounded in warm neutrals. On the reverse, a subtle woven brushstroke design softens and complements the luxurious main pattern. Showcasing an allover scroll jacquard pattern in shades of ivory and gray with a hint of apricot, this gorgeous comforter set enriches your bedroom with elegant style. The Belissa Comforter Set from Waterford Fine Linens features exquisite details and reverses to a subtle woven jacquard. The comforter and shams are finished with a detailed cord and flange. The Waterford Aidan Bedding Collection showcases a scroll jacquard pattern in gunmetal gray which works beautifully with an elegant or casual bedroom décor. The Aidan Comforter and pillow shams reverse to a subtle woven jacquard and are finished with a flange construction. Pillow shams have a hidden zipper closure. Soft and subdued, the Waterford Gloria comforter set in seafoam cotton chambray features whipstitch ivory embroidery in a vine scroll pattern across the midsection of the bed. The Shelah Bedding Collection by Waterford Fine Linens is traditional luxury at its best. The ivory ground provides a sleek backdrop for shades of gold and silver yarn woven in an elaborate scroll medallion jacquard pattern. This fully reversible comforter set features a coordinating silver scroll medallion jacquard pattern on the reverse and is finished with a braided cord. Set includes comforter, two shams with hidden zipper closure, and a box pleat dust skirt with a silver and gold jacquard appliqué border. With a rich charcoal ground and ivory distressed floral jacquard motif, the Waterford Angela Comforter set transitions beautifully throughout the year. Set includes comforter and two shams with envelope closure. The Waterford Baylen Bedding Collection showcases a damask jacquard pattern with a dusty blue and taupe ombré effect for added appeal. The Baylen Duvet is finished with a twisted cord trim and reverses to a subtle pattern in taupe. A hidden button closure on the duvet provides a clean look and hidden corner ties secure the duvet from shifting. The pillow shams have a flange construction and twisted cord trim with a hidden zippered closure. The duvet set includes the duvet cover and two coordinating pillow shams. Made from sustainable eucalyptus fibers, the Waterford Thayer duvet set in 100% TENCEL® lyocell features an all over paisley jacquard design in a calming blue hue. The silky, smooth TENCEL® lyocell fabric is cool-to-the-touch for luxury you love to sleep in. Made from sustainable eucalyptus fibers, the Waterford Thayer coverlet set in 100% TENCEL® lyocell features a satin stitch detail in a calming blue hue. Wake up in a positively preppy mood with Waterford's Florence bedding collection. An elegant oversized paisley pattern in shades of ivory, blue and taupe shares the spotlight with a menswear-inspired suiting stripe on the reverse, while braided cord trim finishes the tailored look. A striped sateen bedskirt and decorative pillows in a mix of fresh textures add instant richness Adorn your bedroom with pure luxury with the Waterford Abrielle bedding collection. Abrielle is a romantic cotton-polyester jacquard with a framed damask motif in creamy champagne and vanilla colors. On the reverse, a lattice damask pattern is woven to add further dimension to the bed. The Abrielle box pleated bed skirt is a solid heavy weight sateen in a warm ivory color, with a delicate button detail on the pleats. This comforter set includes the comforter, two coordinating shams, a box pleated bed skirt and is finished with an elegant braided cord. Recommended coordinates for Abrielle are the Waterford Kiley sheet set in White, and the Waterford Crystal Quilt in Ivory or Pearl. The elegant Waterford Jonet bedding collection in rich indigo and charcoal features a dimensional woven puckered medallion pattern, and reverses to a classic geometric ogee pattern. This sophisticated duvet set includes the comforter, two coordinating shams, and is finished with a gorgeous braided cord. The recommended coordinates for Jonet are the Waterford Kiley sheet set in Linen and the Connemara Throw in Blue. This intricately woven jacquard pattern in rich charcoal, taupe and black is the epitome of grandeur. The Dimitrios Comforter Set from Waterford Fine Linens features exquisite details and includes a fully reversible comforter and shams finished with cord and flange and a coordinating box pleat bed skirt with gimp trim. Warm and inviting, the woven oversized damask Amarah bedding collection in a deep cabernet color adds magnificent glamour to your bedroom. The trellis scroll pattern on the reverse is woven in complementary tones of cabernet and taupe and is pieced into the coordinating sham for a designer look. The cabernet colored Amarah tailored bed skirt features stylish box pleats in a heavy weight sateen fabric. 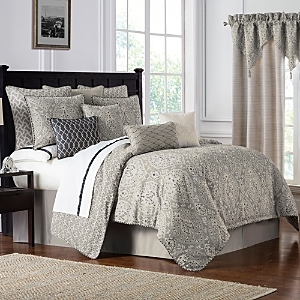 Relax and enjoy the casual sophistication of the Waterford Asher Bedding Collection. This detailed jacquard motif features a navy ground with ivory and bronze accents. Comforter and shams fully reverse to coordinating navy and ivory jacquard and are finished with a multicolor twisted cord. The tailored bed skirt in rich navy features an ivory and bronze herringbone patterned trim. Made of polyester jacquard with leaf pattern in taupe, ivory, and gray with gold accents. Reverse of comforter is a watercolor design in the same color palette. Shams have cord trim; tailored stripe jacquard dust skirt has an 18" drop. A lovely grey and ivory medallion cameo pattern is intricately woven to look like subtle raised dot embroidery in this sophisticated Waterford Celine Bedding Collection. The smaller medallion pattern on the reverse is woven in a complementary grey and ivory. The bed skirt has solid peekaboo pleats. The rich Waterford Annalise bedding collection features a softly textured gold damask motif woven with subtle hints of shine. On the reverse, a delicate woven scroll pattern offers a beautiful gold and ivory accent to the main pattern. The box pleated bed skirt has an elegant border frame in a rich diamond pattern. 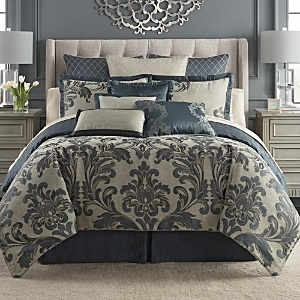 Britt scroll-pattern comforter set. Comforter has a gold foulard pattern on reverse. Made of polyester. A dramatic and stylish addition to your home, the Waterford Farrah Bedding Collection features an oversized woven leaf scroll pattern in a soft aqua and grey color. The bed is softened with a painterly strié woven into the motif, and is finished with an elegant corded flange. On the reverse, a grey leaf jacquard. Made of polyester. Floral comforter and shams have a jacquard reverse to match the tailored dust skirt with 18" drop; shams are framed with cord trim. Timeless shades of ivory and cream lend elegant appeal to the Paloma comforter sets from Waterford. Woven with a regal medallion jacquard featuring invigorating cream and aqua tones, the Jonet bedding collection from Waterford Home brings classic style with contemporary appeal to any bedroom setting. Tie your room together with the coordinating decorative pillows and window treatments A gorgeous ivory and gold chenille floral jacquard design, reversing to a golden ivory scroll jacquard. Beautify your bedroom. Ornate patterns and hues of aqua and gold give this Aramis by Waterford bedding set its elegant style. Set your bedroom ablaze with the shimmering style and luxe feel of these Olivette comforter sets from Waterford. Featuring a soft ground in shades of vanilla and taupe illuminated with brilliant, slightly-distressed floral medallions in gleaming gold, these elegant ensembles put the sparkle back in your space. Transform any room into a luxurious space with the solid-gold style and comfort of the Anya bedding collection from Waterford Home, featuring brilliant floral-scroll patterns, gleaming ogee medallions and all the pieces you'll need for a polished look. The Gwyneth bedding collection from Waterford features prints that echo the richly textured three-dimensional scrollwork in the embroidered and quilted pillows, making it the perfect choice for updating your decor. Midnight blue over scaled chenille jacquard, reversing to a jeweled toned midnight blue and emerald scroll. Chenille cord finish. The Landon bedding collection from Waterford features a paisley pattern and taupe ground, a stylish combo that will help establish a relaxing atmosphere in any bedroom. 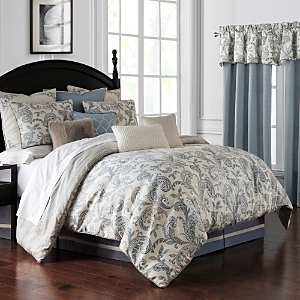 Feminine flourishes define the romantic spirit of Waterford's Sydney bedding collection. Cast in inviting tones of ivory and taupe, the comforter and shams feature a pastel petaled jacquard on one side and a textured dot floral motif on the reverse. Rich details like braided rope trim, ruffle flanges, elegant botanical embroidery and darling rosettes complete the polished-meets-pretty vibe of your bedroom The Bainbridge bedding collection by Waterford calls upon rich floral damask and intricate embroidery to imbue your bedroom with luxurious sophistication. The sophisticated Everett Bedding Collection by Waterford features a plush woven damask motif that reverses to a woven trellis scroll pattern for added versatility to your bedroom decor. Allegra Duvet Cover and Sham with Embroidered Insets are made of linen. Grace notes for your bed: lace-edged Annabelle and embroidered Allegra. All of creamy, machine-washable linen. Duvet cover set with embroidery detail. Stonewashed cotton. Coverlet with geometric petal pattern. Stonewashed cotton. Gathered dust skirt. Linen voile. Trimmed with soft, frayed ruffles, this linen bedding blends simplicity and elegance for a subtle bohemian effect. Hand-woven eyelets are a delicate, subtly feminine accent on this luxurious linen bedding. Imbued with creator Hilde Leiaghat's romantic Belgian design instincts, LA-based Pom Pom at Home creates "lived-in elegant" collections crafted from the highest quality cotton and linen.